Alistair is originally from Port Talbot, Wales but has been living in New Zealand for 20 years. He talks about his journey in the world of Rugby, from playing to video analysis work to coaching. He explains how his video analysis work got picked up by the New Zealand senior team very quickly and this lead him to an amazing adventure that spanned 3 world cups, 2 of which New Zealand won. Alistair’s desire to become a full coach became a reality when he took over as the defensive coach for the ... See More Aukland Blues in 2016. He talks about the learning from this experience, and what he’s plans for the future are. Alistair is currently an assistant coach of Samoa and also works for the NZRU as a high-performance coaching. An awesome story and one that is loaded with useful 1% Better insights. Have a listen. Full summary below. 5 min - Alistair’s background and Quelsh! 9:00 – Moving to New Zealand to Learn his Craft at the age of 21! 13:30 – Life in the Office Working World but having a passion for coaching & teaching! 18:00 – Monday Night Analysis for Club Rugby & Having a Moneyball Impact! 20:00 – Analysis work really opening up Alistair’s eyes to the game! 21:00 – Getting picked up by the full New Zealand Team quickly! 22:00 – Providing Analysis & Advice, not just data! The passion for rugby helped. 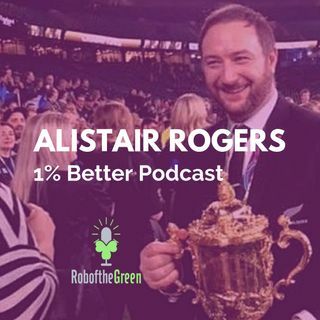 23:00 – Emailing an All Blacks Coach that changed Everything! 24:00 – Ask for Advice in an Email, not look for something else! 26:00 – Working at Telecom in NZ and making a mistake – but always learning! 27:00 – A Value of Encouragement in the NZ Culture – Find ways to fix the problem. 29:00 – From the Coffee to full time working with the All Blacks within 6 months – Getting a standby call up for the first world cup! 31:00 – Working with Wayne Smith and a huge game changer for Alistair. 32:00 – The 2007 World Cup and the next year was a big learning for Alistair. 41:30 – Always knowing a move back to Coaching was the plan but when is the right time? 44:00 – Knowing the 2015 World Cup would be the End of that part of the story but the starting of another! 46:00 – Building Plans, Programs, Strategies and How to Get Better Outside of the New Zealand Group! 48:30 – Stepping into the Coaching Game & Learning Fast! 53:00 – Finding out Who am I as a Person, Dad, Husband, & Coach! 54:30 – Fact finding in the US with Chicago Cubs & Seattle Sea Hawks. - Michael Gervais as a great help! 56:00 – Living a Growth Mindset and Fully understanding yourself! 57:00 – Understanding the philosophy and Resigning from the role! 1:02:00 – Building Relationships through Coaching – This is the Key! 1:04:00 – The mix of intuition and analysis – Experience and Feelings! 1:05:00 – Having the ability to see what’s important now! 1:08:00 – Knowing what to do with the information gathered? 1:10:00 – Social Styles of Learning – How your team Learn? 1:13:00 – Finding the Balance between Vulnerable and Strong!